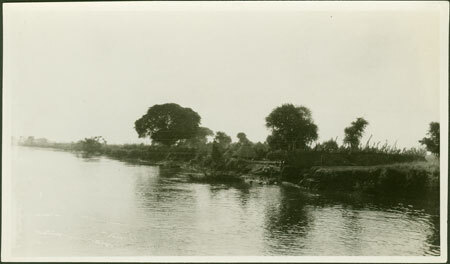 A village site on the banks of a large river (possibly the Sobat), surrounded by a fence with extended posts, some of which may be notch-carved in the manner of some Anuak homesteads. Morton, Chris. "?Anuak village on riverbank" Southern Sudan Project (in development). 03 Jan. 2006. Pitt Rivers Museum. <http://southernsudan.prm.ox.ac.uk/details/1998.204.5.26.2/>.